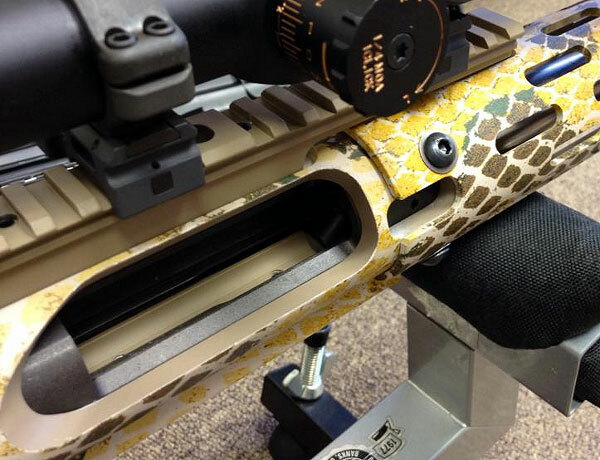 Get ready for a revolution in the F-Open, ELR, and Long-Range Benchrest games. Sierra just introduced a new 7mm bullet with a stunning 0.780 G1 BC. 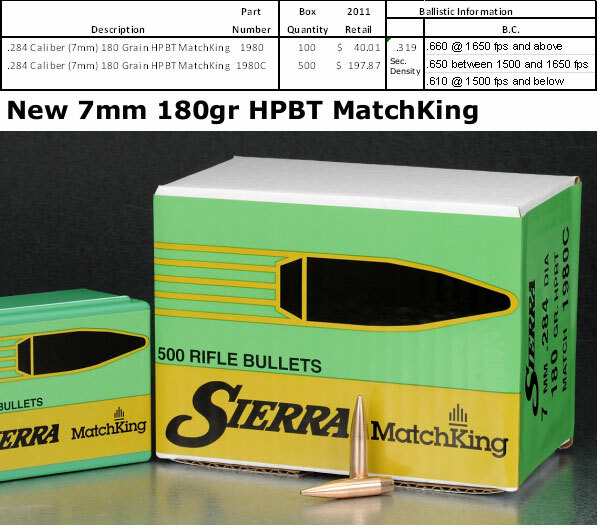 This new 197-grain HPBT MatchKing is one of the highest-BC, jacketed .284-caliber projectiles ever offered to the public. By comparison, Sierra’s own advanced 183-grain 7mm Matchking has a .707 G1 BC. That means the new 197-grainer has a 10% higher BC than the already slippery 183-grainer. That’s an impressive achievement by Sierra. We expect top F-Open and long-range shooters will be trying the new 197-grainer as soon as they can get their hands on this new projectile. 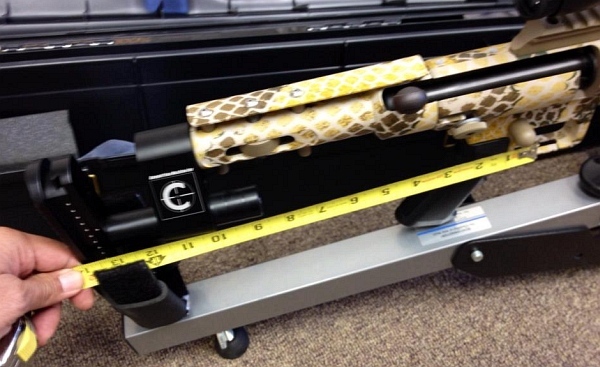 They may need new barrels however, as Sierra states: “This bullet requires a barrel twist rate of 1:7.5″ or faster”. Sierra expects to start shipping these slippery 7mm 197s very soon. 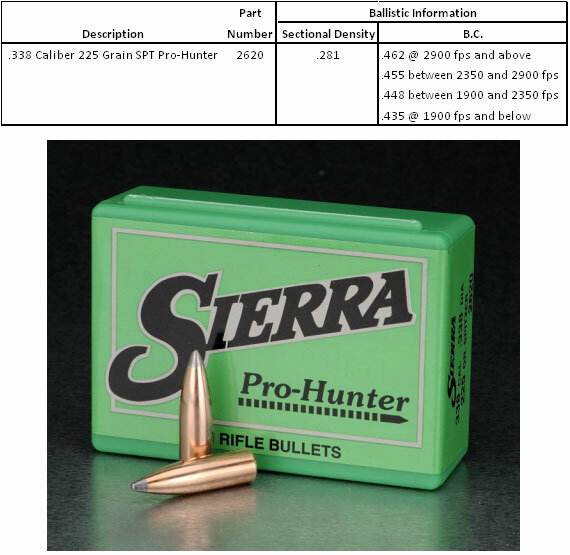 You can order directly from Sierra’s website, stock code #1997, $54.20 for 100 bullets. 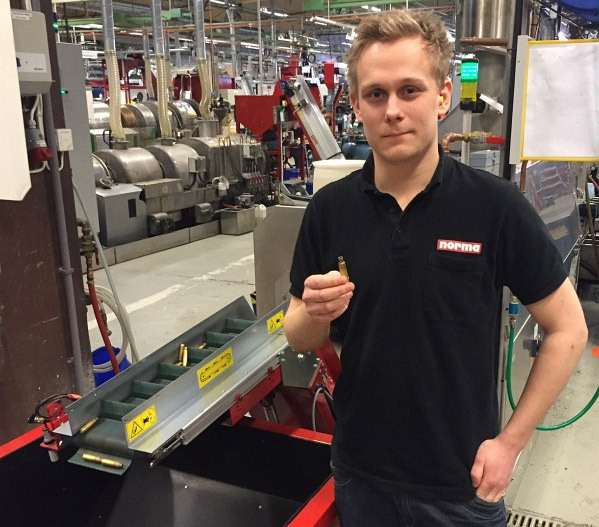 Sierra has officially announced that the 197gr SMK will come “pointed” from the factory. These impressive new 197s will have a “final meplat reducing operation” (pointing). This creates a higher BC (for less drag) and also makes the BC more uniform (reducing vertical spread at long range). Our tests of other factory-pointed Sierra MKs have demonstrated that Sierra does a very good job with this pointing operation. The “pointed” MatchKings we’ve shot recently had very nice tips, and did hold extremely “tight waterline” at 1000 yards, indicating that the pointing process does seem to enhance BC uniformity. Morever, radar-derived “real-world” BCs have been impressively uniform with the latest generation of pointed Sierra MKs (such as the new 110gr 6mm MatchKing). Shooters around the world will appreciate the accuracy and extreme long range performance of our new 7mm 197 grain HPBT (#1997). A sleek 27-caliber elongated ogive and a final meplat reducing operation (pointing) provide an increased ballistic coefficient for optimal wind resistance and velocity retention. 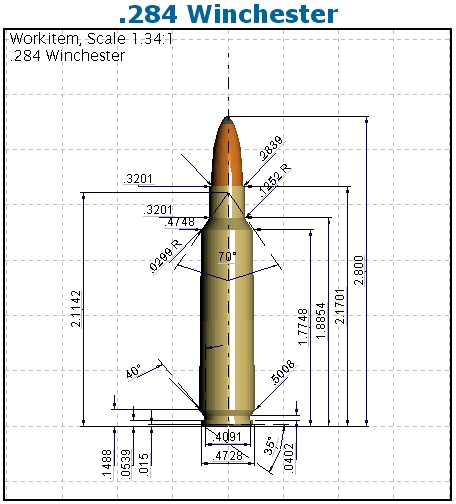 To ensure precise bullet to bore alignment, a unique bearing surface to ogive junction uses the same 1.5 degree angle commonly found in many match rifle chamber throats. While they are recognized around the world for record-setting accuracy, MatchKing® and Tipped MatchKing® bullets are not recommended for most hunting applications. Although MatchKing® and Tipped MatchKing® bullets are commonly used for varmint hunting, their design will not provide the same reliable explosive expansion at equivalent velocities in varmints compared to their lightly jacketed Hornet, Blitz BlitzKing, or Varminter counterparts. 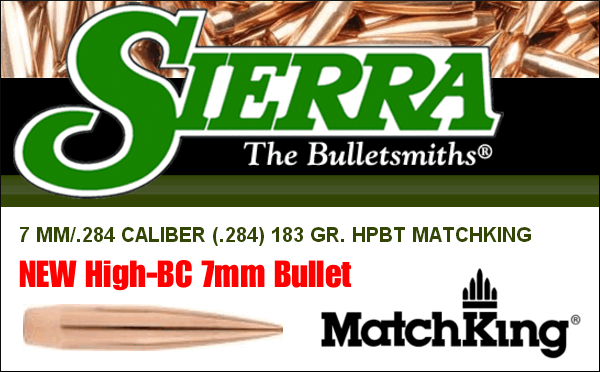 Share the post "Sierra Offers New Ultra-High-BC 197gr 7mm (.284) MatchKing"
With every new season, standards in the F-Class game are climbing ever higher. Shooter are improving their skills set while equipment and loading techniques are improving (thanks in part to websites such as this). Evidence of the level of improvement in F-Class shooting comes from the UK, where a talented shooter drilled a new GBFCA record score. 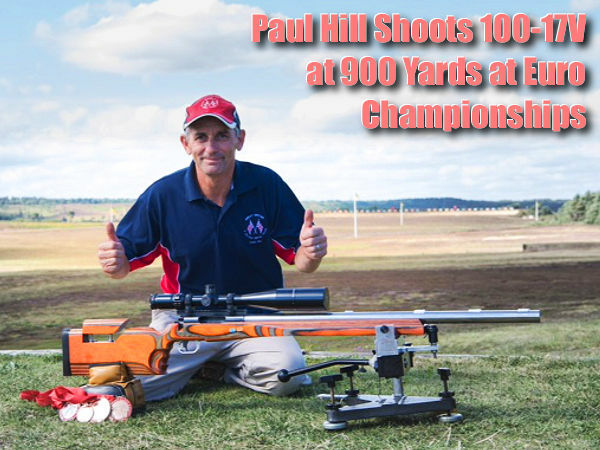 One of our rising stars on this side of the pond is F-Open shooter Paul Hill. He hails from England’s wide-open flat lands where the wind blows strongly in from the North Sea and where a shooter must soon learn to read the wind. Bear in mind the style of shooting here in Great Britain is pair-firing. Under this procedure, each of two competitors shoots alternately, taking turns from shot to shot. Each shooter has 45 seconds to get his shot off. Allowing for the target pullers to do their jobs, this means that each shot can take up to one minute. As Paul was pair firing, he had to concentrate for up to 40 minutes to get all 20 shots off! You can imagine how many times the wind changed course in those 40 minutes — pick-ups, let-offs, changes of angle and direction. Paul had to counter each change and still managed to keep 17 shots in that 5-inch circle! 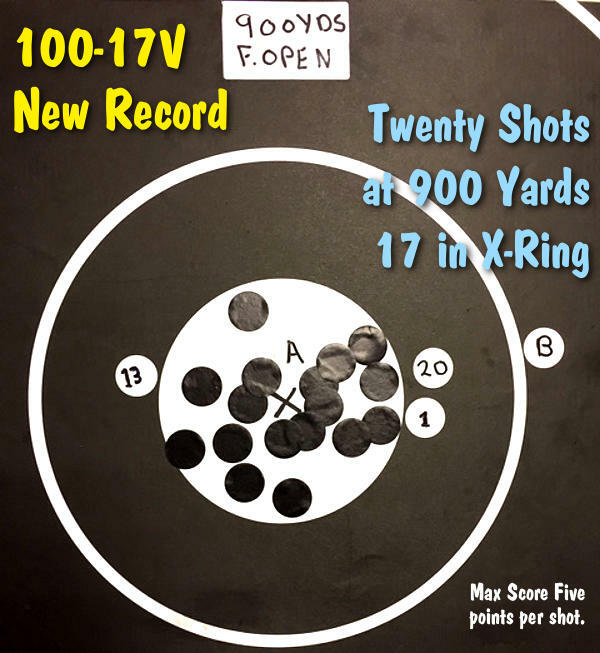 What makes this new GBFCA record all the more significant is that Paul did it by barreling his own rifle — and for the first time! By simply taking great care and attention he has chambered and fitted a barrel himself to the very highest standards. Paul chambered the Krieger 1:9″-twist barrel for the .284 Winchester cartridge. His action was a Barnard. The stock is by Joe West. Records are made to be broken, but we think it will be quite a while before Paul’s 200-17X is surpassed in European competition. If you feel up to that challenge, consider competing in next year’s European Championships in late September 2017. Share the post "English Shooter Sets New Great Britain F-Class Record"
Right now Precision Reloading is running a BIG SALE on Sierra MatchKing (MK) and Tipped MatchKing (TMK) Bullets. These bullets are being offered at deep discounts, with very low prices (some close to wholesale). 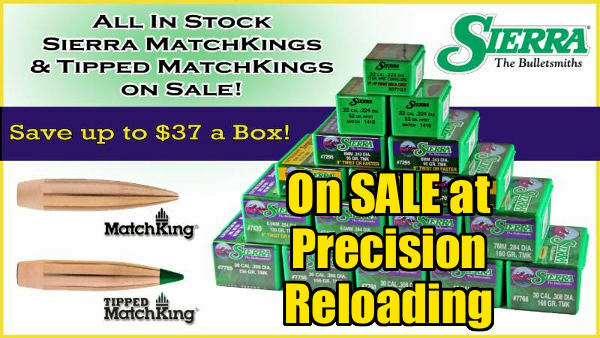 Precision Reloading says you can save up to $37.00 on 500-ct boxes. 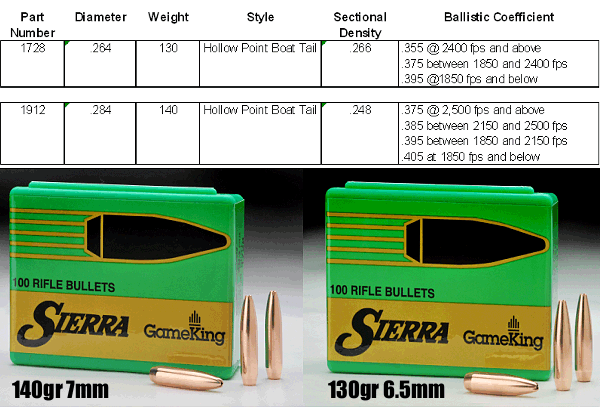 Here are just a few examples of the dozens of types of Sierra Bullets on Sale. 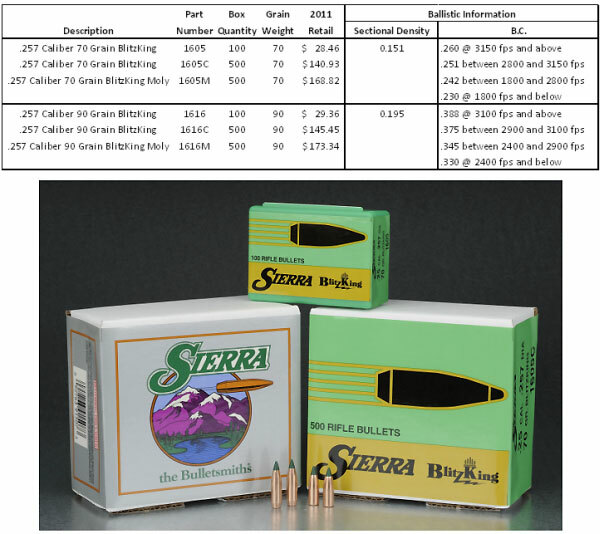 NOTE: This Sierra Bullets Sale runs through October 31, 2016, so you’ll want to place your order before the end of the month. Sierra offers the widest selection of .30-Caliber match bullets in the world today, producing bullets suited to nearly every form of long-range competition. Along with classic HPBT and HP MatchKings, Sierra now offers the new Tipped MatchKing (TMK) line, which feature an acetal resin tip. The major advantage of adding a tip to the bullet is the reduction of drag, producing a more favorable ballistic coefficient. Another benefit is improved feeding in magazine-fed firearms. Share the post "Great Sale on Sierra Bullets at Precision Reloading"
7mm RSAUM in a bolt-action bullpup? Yes it works. 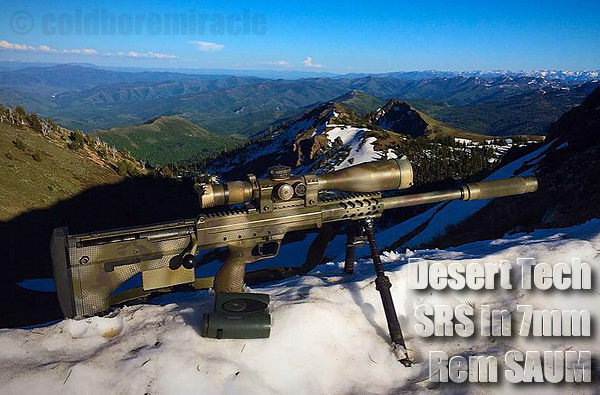 A talented shooter, who calls himself “ColdboreMiracle” in social media, has a Desert Tech SRS bullpup rifle chambered for the 7mm SAUM, and it hammers. 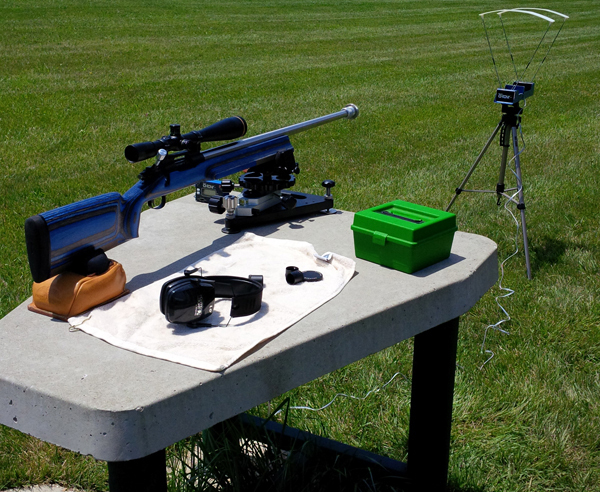 The 7mm Remington SAUM (Short Action Ultra Magnum) is popular with F-Open competition shooters. It can also work well for long-range hunting and tactical tasks. Learn more about the 7mm Remington SAUM in our 7mm Cartridge Guide. 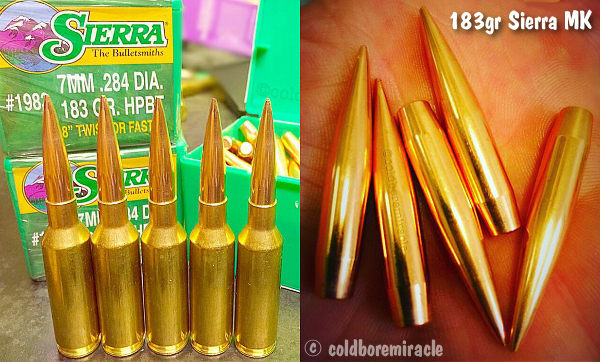 Mr. ColdboreMiracle tested the new generation 183gr Sierra MatchKings (item # 1983). These impressive projectiles are “tipped” at the factory. Claimed G1 BC is a lofty 0.707 (at 2300 fps and above). We have heard other reports that these bullets “hold waterline” exceptionally well at 1000 yards. That indicates the bullet-to-bullet BC is very consistent. No doubt the factory uniforming/pointing of the bullet tips helps in that regard. As you can see, these 183-grainers shoot well in ColdboreMiracle’s SRS rifle. Here are five shots at 100 yards. That’s very impressive for a tactical-style rifle shot from a field-type bipod. ColdboreMiracle says the bullpup design has many advantages: “The Stealth Recon Scout (SRS) rifle from Desert Tech is a bullpup-configured precision rifle with a shorter length than many carbines. The SRS has a multitude of barrel options that can be swapped in under a minute — all of them come with a 1/2-MOA accuracy guarantee and return to zero. The SRS’s bullpup design puts the rifle’s COG closer to the shoulder, making the rifle balance better off-hand. The straight-line geometry of the SRS makes recoil seem lighter, and barrel hop is reduced, allowing the shooter to stay on target better. It takes a little getting used to, when converting from a traditionally-configured bolt gun. But once you do, you won’t go back.” To learn more about this rifle (and other Desert Tech arms), visit ColdboreMiracle’s Facebook Page and YouTube Channel. 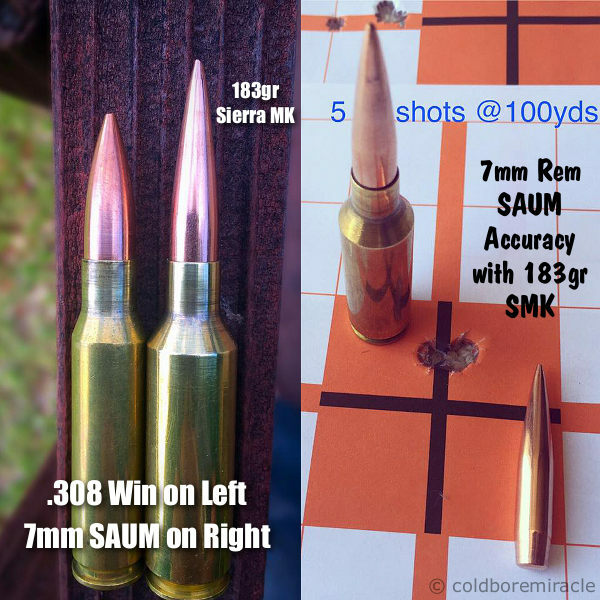 In some respects, the 7mm SAUM cartridge may be better than the 7mm WSM. The 7mm SAUM holds less powder — but that’s a good thing, since the capacity is more than adequate to do the job. You can drive the 180s at 3000 fps with a SAUM using less powder than with a WSM. Additionally, the SAUM case has a slightly longer neck. This gives you greater flexibility in bullet seating. With a long neck you can set the throat so the long 180+ graing bullets are above the neck shoulder junction, yet you can still seat shorter hunting bullets close to the lands. Additionally, long case necks, some believe, cause less throat erosion than shorter necks. That’s not “hard science” but it is certainly a view shared by many experienced shooters. The long neck is one reason many varminters favor the 6mm Remington over the .243 Winchester. Share the post "Bullpup Ballistics: 7mm RSAUM in Desert Tech SRS Rifle"
Lapua’s Scenar-L bullets are extremely consistent in weight and dimensions. In our tests, the 6mm 105gr Scenar-L proved to be as uniform in weight and base-to-ogive length as any factory bullet we’ve ever measured. Scary consistent. Now there is a full line-up of Scenar-L bullets in .224, 6mm, 6.5 mm, 7mm, and .308 calibers. Yes, that’s right, Lapua now makes a 7mm match bullet. In fact, Lapua makes two: a 150-grainer and a big, high-BC, 180-grainer. All these Scenar-L bullets are carried by Grafs.com. There are good supplies in most calibers, but the 7mm 180s (item LU4PL7401) are nearly sold out, and the 6mm 105-grainers are sold out. 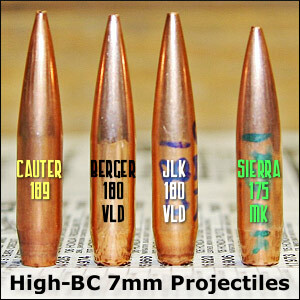 More of these popular 6mm and 7mm projectiles should arrive later this summer. For a limited time, if you purchase Lapua bullets, brass, or loaded ammo from Grafs.com, you can get a FREE Lapua cap. NOTE: Quantities are limited, and this offer is restricted to one per customer. In the above video, Peder Mørch Pedersen demonstrates the accuracy of Scenar-L bullets in a Blaser R8 GRS rifle chambered in 6mmBR Norma. Peder was shooting from bipod at 300 meters on a sunny day in Vingsted, Denmark. 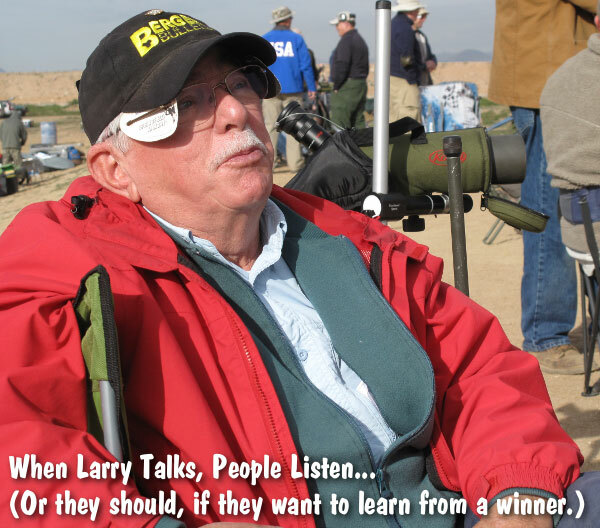 Share the post "Lapua Scenar-Ls are Ultra-Consistent — Free Lapua Hat"
Larry Bartholome (aka “LBart” on our Forum) is the current F-Open USA National Champion. He also won the F-Open division at the recent Berger Southwest Nationals. A “Senior Citizen” now, Larry is still at the top of the F-Class game. If you were to pick the top ten F-Open shooters on the planet, Larry would be on the short list, that’s for sure. In a recent AccurateShooter Forum thread, there was a discussion of caliber/cartridge choice for F-Open shooting — specifically whether 6mm cartridges can be competitive at long-range (as opposed to mid-range). Matches are won with what people decide to shoot. The people win matches, not the calibers. A person makes his decision on what he is going to shoot with and [that person] wins or loses based on the decision. The smaller cases and bore sizes have advantages in less recoil and more inherent accuracy. They are easier to shoot well. Because they shoot smaller groups on average they make the 10 ring seem bigger. With light winds that helps. When the wind gets to changing and picking up this advantage is negated by the wind drift advantages of the larger calibers. Once the switches and velocity changes get beyond the mind’s ability to stay up with them, the small caliber advantage is minuscule. My own thought is I need all the help I can get. I know I can’t read the wind. I play the percentages. [My 7mm offers] good grouping, good wind drift, lower recoil than the 30s. 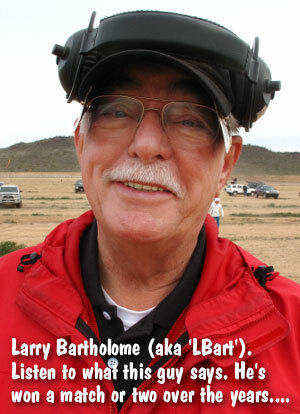 My 7mm/270 WSM was shooting very well in Phoenix, just as the other Bartlein barrels shot well in Raton. The points lost were mine, not the rifle’s or the caliber. When the wind flags and mirage are telling you to hold left and your bullets are going left, no caliber in the world will help you. You are the one steering those bullets. Share the post "“People Win Matches, Not the Calibers” — Larry Bartholome"
Lapua just dropped a bombshell — multiple bombshells, in fact. 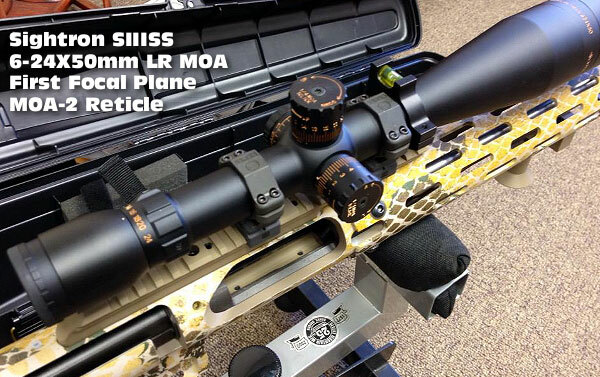 Lapua just announced that it will be producing .221 Fireball brass and .50 BMG brass starting early 2014. This will be the first truly match-grade brass ever offered for the .221 Fireball. That’s great news for varminters, who can use Lapua’s new .221 Fireball brass “as is” or neck it down to .20 Vartarg or 17 Fireball. Tactical shooters can also use the .221 Fireball brass to make the .300 Whisper and 300 Blackout sub-sonic cartridges. At the other end of the spectrum, ultra-long-range shooters now have a new ultra-premium brass source for the mighty .50 BMG. This is potentially a “game-changer” for fifty-cal shooters who have had to “make do” with military surplus brass for the most part. 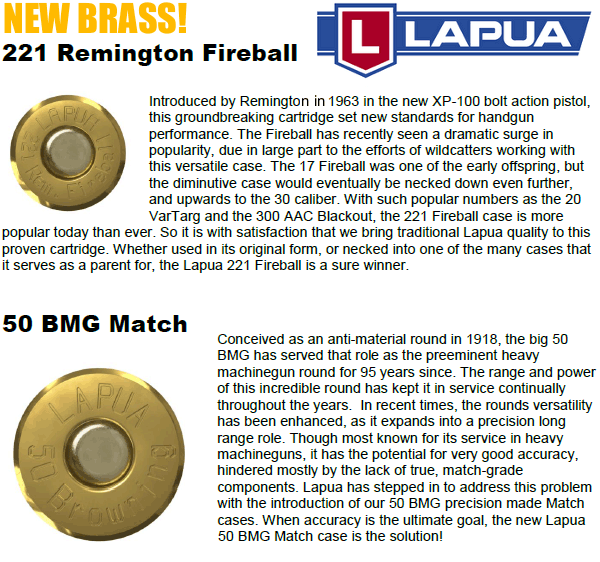 Lapua says the new brass, both .50 BMG and .221 Fireball, should be in the USA by early April, 2014. Sorry, no pricing info is yet available. The other big news from Lapua is the release of two new 7mm (.284 caliber) Scenar-L target bullets. Recognizing the popularity of 7mm cartridges among F-Class Open Division shooters, Lapua will offer a high-BC, 180-grain bullet. As part of the “L” series, this new 180-grainer bullet should exhibit extreme consistency in base-to-ogive measurements and bullet weight. We expect this new 180gr projectile to be extremely accurate in the .284 Winchester, .284 Shehane, 7mm WSM, and 7mm RSAUM — popular chamberings for F-Class and long-range benchrest shooters. No BC information has been released yet, but we expect the BC number to be quite high, giving this bullet great wind-bucking capability. 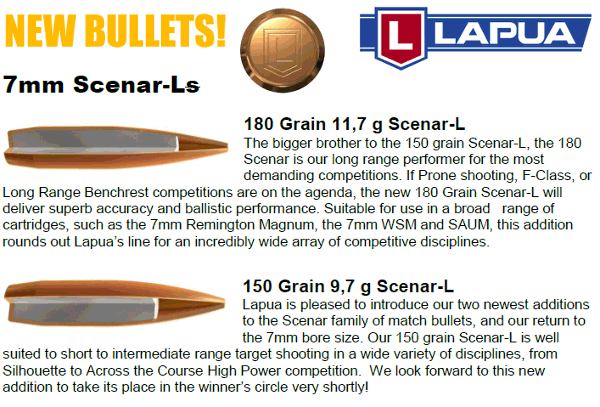 In addition to the new 180gr 7mm Scenar-L, Lapua will offer a new 150gr 7mm bullet. This is optimized for medium range competition in Silhouette and Across-the-Course competition. It should offer great accuracy, but with less felt recoil than its 180-grain bigger brother. Share the post "Lapua 2014 News — .221 Fireball and .50 BMG Brass, 7mm Bullets"
Share the post "Sierra Introduces New 6.5 and 7mm “Skived” Hunting Bullets"
With a price of $89.99 for for five hundred 7mm (.284) bullets, that’s a great deal for big-name manufacturers’ bullets, even if there are some cosmetic defects. That bulk price works out to just $18.00 per hundred bullets! Midsouth can’t disclose the bullet manufacturer, but we can assure you it’s a big name company with a reputation for quality. If you need some good 7mm hunting bullets, you may want to jump on this deal before Midsouth sells out. 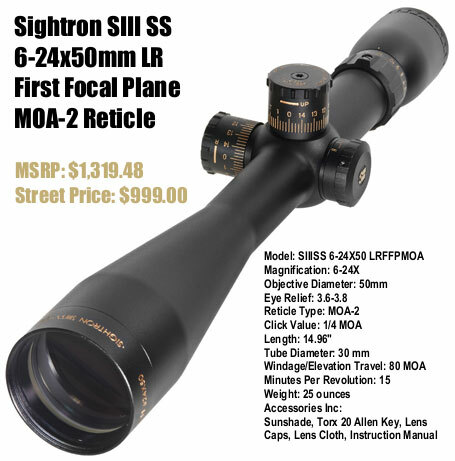 Visit MidsouthShootersSupply.com or CALL 1-800-272-3000 to order. 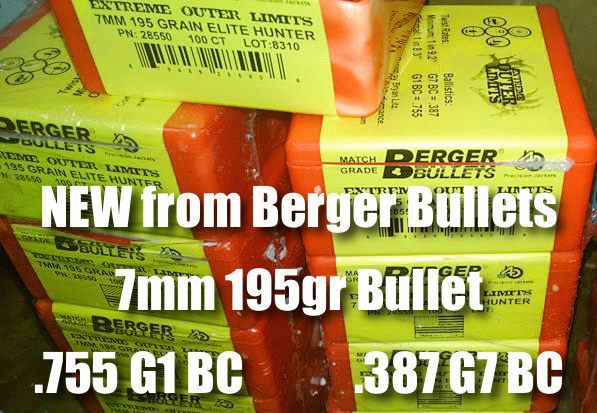 Share the post "Great Deal on Bulk 7mm Bonded Bullets at Midsouth"
Share the post "New Sierra 7mm and .338 Bullets for 2011"
Hey guys, here’s your chance to buy Berger Bullets at super-low prices. 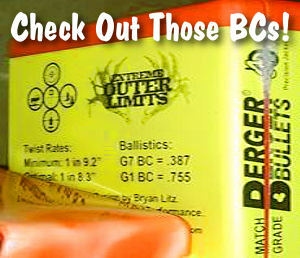 Berger has arranged an exclusive “Bullet Sell-Off” promotion for AccurateShooter.com readers. These bullets are not blems or damaged. They are mostly first-quality overruns. After yesterday’s sale, what’s left are primarily 22 caliber. Some are moly-coated but most are not. The prices are insanely low on these sell-off bullets. You can save $10 per 100 (or more) on some types. Berger will sell these bullets for the next few days. 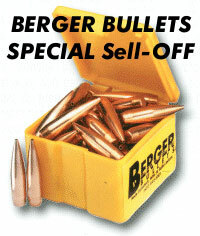 To purchase the Special Sell-Off bullets, call Berger’s main line at (714) 447-5456 to place the order. Doing this will help keep things sorted out as the calls come in — first call, first served. UPDATE: The 17 Cal just sold out. Share the post "Berger Bullets Special Sell-OFF — Save Big Buck$"
Hodgdon Powder Company announced that an error occurred in printing of the 2010 version of the Hodgdon Annual Manual. Pages 108 and 109 in the manual, which cover 7mm caliber load data, appear in reverse order. But don’t despair — you can get a free correction from Hodgdon. 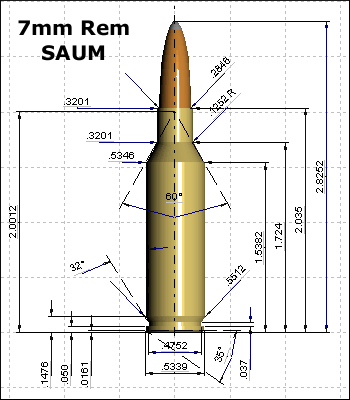 Do not use the 7mm caliber data as it appears in the 2010 Hodgdon Annual Manual until the corrected copy is received. 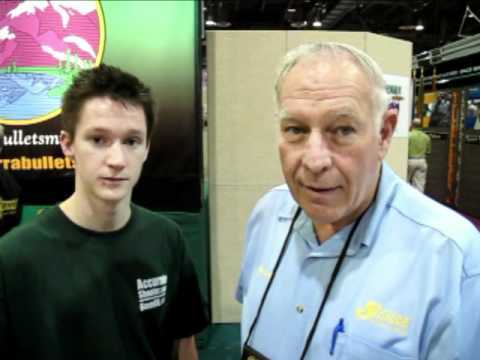 All Hodgdon, IMR®, and Winchester® reload data is also available on-line at hodgdon.com, imrpowder.com, and wwpowder.com in the Reloading Data Center. 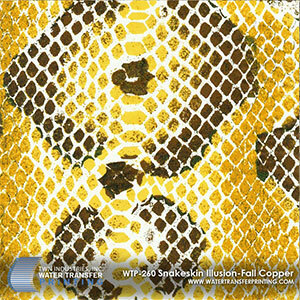 Share the post "Printing Error in Hodgdon 2010 Manual — Get Free Fix"
Hail Britannia! 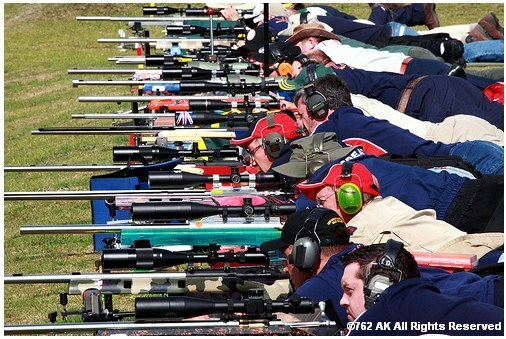 UK Shooters Dominate World F-Class Championships. USA F-TR Team Wins. 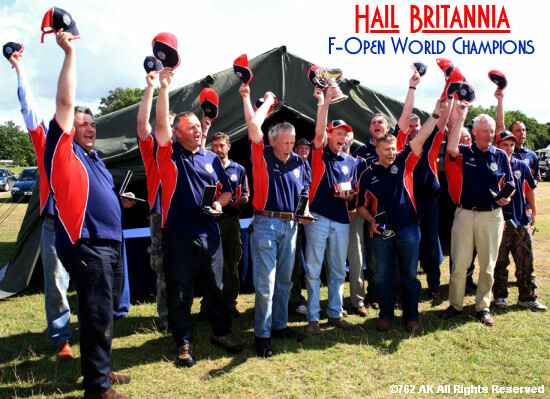 This year’s 2009 World F-Class Championship was held at the historic Bisley Range in England, and UK Shooters served their country proud, winning the prestigious F-Open Team Competition and dominating the individual matches in both F-Open and F-TR classes. 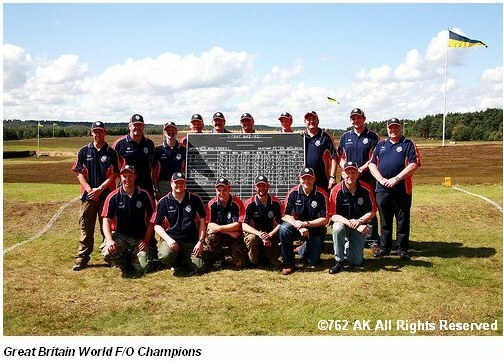 Great Britain’s F-Open shooters proved their mastery of the challenging Bisley course, posting a 3436-230V score to top the second-place American Team by 59 points (Team USA score was 3377-234V). The South African Team, defending Champions, finished third with a 3337-188V score. UK Shooters truely dominated the Individual F-Open Championship, capturing ALL of the top ten places, lead by Gary Costello (1st Place) with 458-44V, followed close behind by fellow Brit Des Parr with 456-36V. That’s nine Brits and a Scot in the Top Ten. In the Individual Competition, F-TR division, Britain finished one/two at the top of the podium, with Russell Simmons (437-23V) winning the Gold, and countryman George Barnard (432-23V) winning Silver. American Stan Pate took third with a 420-25V score. 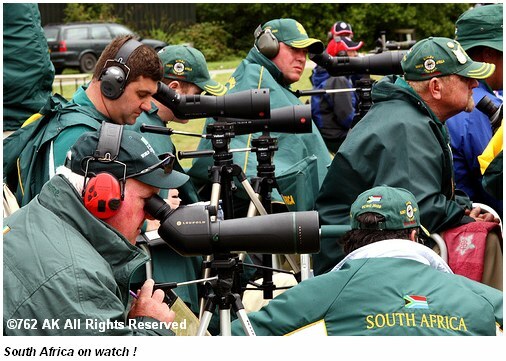 EDITOR’s NOTE: In the previous F-Open World Championships in South Africa, Team USA was defeated by the home team South Africans who were shooting 7mms. At Bisley in 2009, the same thing happened, with the Brits winning on their home turf, again using 7mms. Do we see the writing on the wall? CLICK HERE for Complete F-Class Championships Results. 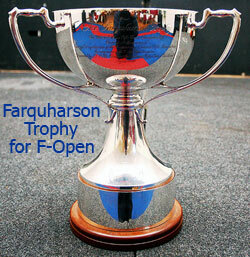 CLICK HERE for 2009 F-Class World Championship Photo Archive. In the F-TR class the American Team powered to victory, haulting the British juggernaut. Under the leadership of Captain Darrel Buell, and coach Gary Rassmussen, shooters Brad Sauve, Dale Carpenter, Warren Dean, Monte Milanuk, Paul Phillips, Stan Pate, Jeff Rorer, and John Weil won the F-Class Restricted Teams Match with a 1581-76V score. The USA Rutland Cup Open Team of David Bailey, Mike Downey, David Gosnell, and Larry Taite, coached by Nancy Tompkins, also finished first, besting a strong Great Britain Red squad (second place), and Don Nagel’s third-place Connecticut Yankees. All photos © 2009 by 762_AK, used by permission. Share the post "Hail Britannia! UK Shooters Dominate World F-Class Championships. 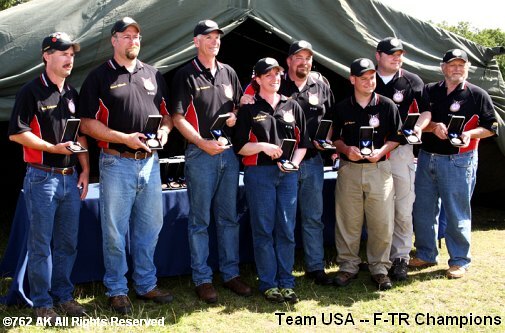 USA F-TR Team Wins."